A few photos from my garden blackbirds taken yesterday, through two layers of glass. 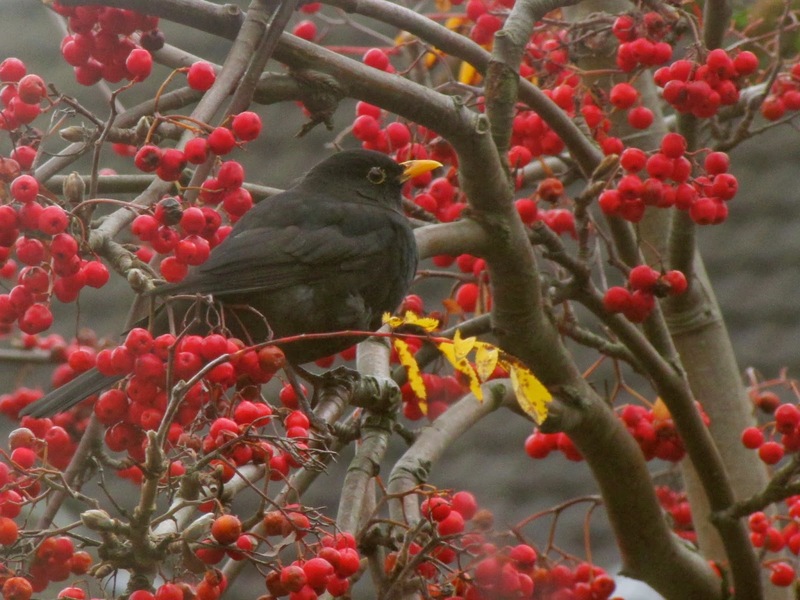 The rowan is still loaded with bright, fat berries, which seem to be keeping well. A female, above, about to swallow one. A male, below, had a quiet time after feeding. This other male (below) has started visiting my garden recently. A quite distinctive individual due to the large white patches on his head. 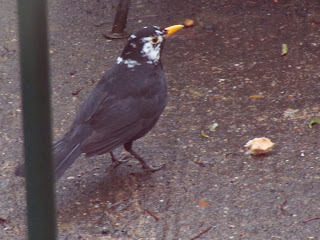 White feathers, often on the head, are quite common in my local blackbirds, but the extent of this individual white markings is the most extreme I've seen around here. 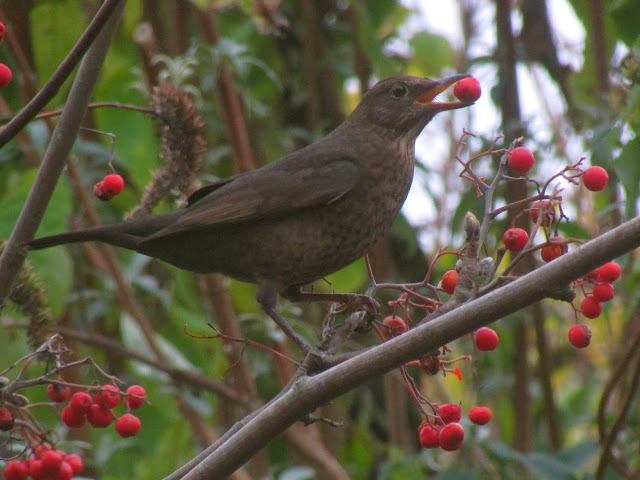 So this is the Blackbird you told us about the other day! I love it. Surprisingly, I hadn't seen a leucistic Blackbird until I came to Britain. I'd heard of them but I thought they weren't too common. Leucistic Blackbirds are fairly common in my local patch, Kensington Gardens. Here is one with a lot of white. 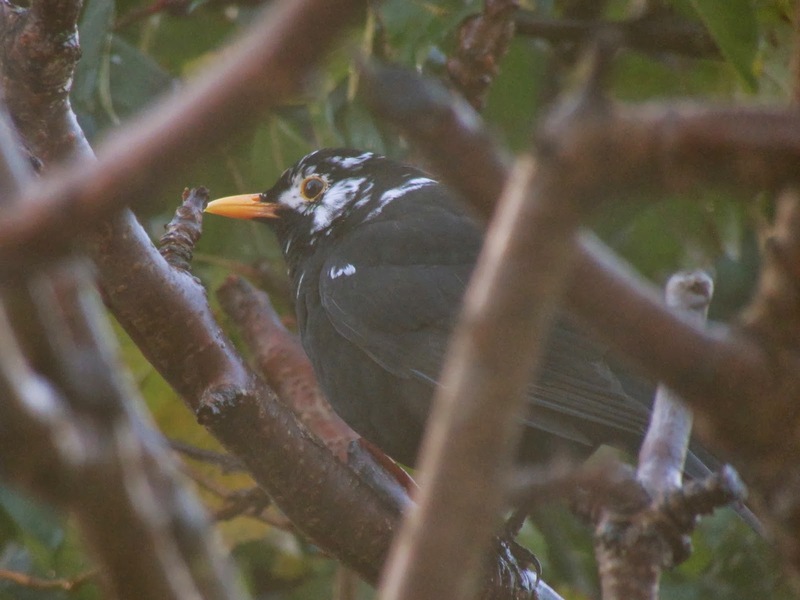 Thank you for commenting Ralph, wonderful portrait of your very leucistic blackbird, with white wing feathers too! Yes, Gui, that's him. There seems to be a lot around, often with a few scattered white feathers. Once I saw one with a completely black head, I didn't manage a photo though.